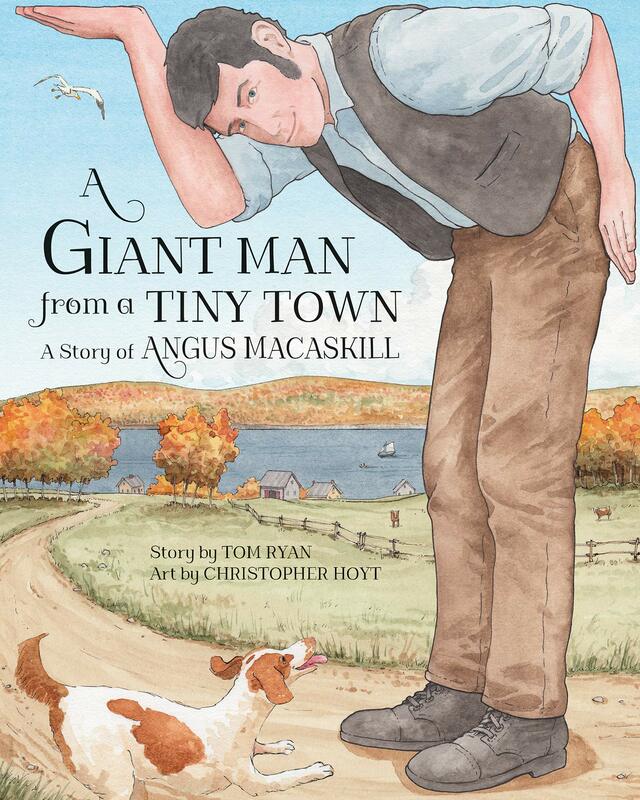 Angus MacAskill wasn’t always a giant. In fact, he was once a small boy. No bigger than the other children in his village. When Angus was still very young, his family left their home on the Scottish Hebrides. As the ship sailed away from the only home he’d ever known, the island his family had called its own for many generations, Angus stared back from the deck of the boat. He wondered what awaited them on the other side of the ocean. The voyage was long, and there were days when it felt like they would never see land again. In the middle of all that water, staring at a wide and open sky. Angus felt like the tiniest thing in the whole world. This gentle story by Tom Ryan is excellently complemented by the soft, lovely illustrations by Christopher Hoyt. Using the limited factual information available about Angus MacAskill, Ryan has chosen to tell his story using the sunny days of MacAskill’s life. The MacAskill family immigrated to Cape Breton Island with no mention of the Scottish Land Clearances that forced the action. The days on the ship were long, but there is no mention of storms, crowded conditions or poor food. They soon became part of the community, but there is no mention of how hard it was to build a house and clear the land. After Angus grew, there is no mention of an incident when he hit a man rendering the man unconscious for more than a day, or that his throwing an anchor over his shoulder resulted in a disabling injury. The story doesn’t continue to Angus’ death, at the age of 38, of ‘brain fever’. These choices are made to fit the story to the target audience of children ages 3-7, and, in that, it is very successful. By the repeated refrain, “Angus felt like the tiniest thing in the whole world”, Ryan provides a point for young readers to realize that their feelings of uncertainty can be shared by people who seem to have every reason for confidence. Hoyt’s illustrations contribute to the sunny feel of the book. The light is uniform throughout, lending a pleasant atmosphere. On the first page of the text, where an adult Angus appears on a city street, the shadows under his chin and arms intensify the sensation of looking up at him. The skillful use of perspective creates compositions with movement or balance as appropriate to what is happening on each page. Figures of birds and the recurring dog are moving, making for lively pictures. On the page that shows Angus standing by a fence at three different ages and showing his growth, the same bird and horse appear and react to the changes, making for a humourous picture. Near the end of the book, when Angus sits in his shirtsleeves, presumably in his room, again the shadows create the mood of loneliness as he decides to return home. In the final illustration, the same dog that appeared earlier is shown greeting him joyfully on his return. There are several themes or points of discussion that run through A Giant Man from a Tiny Town. How does a person fit in when they obviously stand out as different? How and why do immigrants move to new places? (When MacAskill returned to Cape Breton, he purchased land from people who were giving up on Cape Breton and moving on to New Zealand.) The book has the possibility of being more than a pleasant story.